THERE’S always been a quandary for fine art thieves; if you manage to pinch a unique masterpiece, how do you go about actually selling it on? There won't be many punters down the Dog and Duck willing to lay down much more than a crisp tenner for your pilfered Munch. 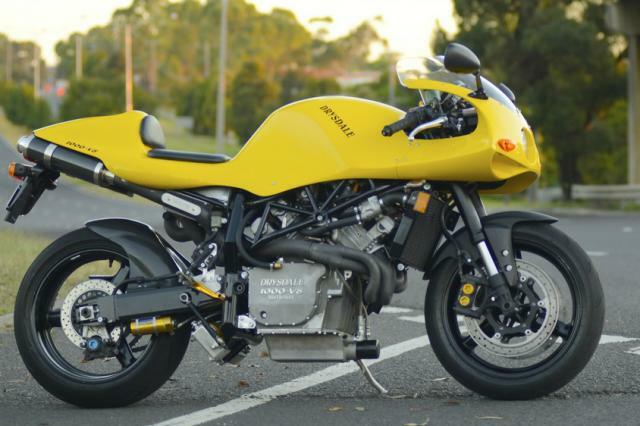 Presumably the bike thieves who, according to Australian Motorcycle News, wheeled an incredibly rare 1000cc Drysdale V8 into the back of a van and drove away on August 5, are now having the same problem. If you’re not aware of it, the Drysdale V8 is a creation of engineering genius Ian Drysdale, the man who also came up with a prototype two-wheel-drive, two-wheel-steer, hydraulic-drive machine back in 1990. He created the V8’s engine by hand, using parts from Yamaha FZR600s. It’s a development of an earlier, 750cc V8 made using FZR400 components back in 1996, and went into microscopically-limited production. The original plan was to make five, but it’s not clear if the actual number of 1000cc V8s is that high. The stolen bike was taken from a house in Port Melbourne while its owner was overseas. AMCN reports that three thieves broke through a security gate and cut locks to gain access to it before loading it into the van, so presumably they knew it was a rare and valuable machine. But who could they possibly sell it to without arousing suspicion? It’s not even like it’s worth breaking for parts, since the bespoke components could again be easily traced, while the mass-made ones – like the Yamaha engine components – hold little value. If, by any chance, you do meet a dodgy character down the pub who asks if you’d like an incredibly rare V8 motorcycle at a knock-down price, the cops in Australia would like to know about it. Sign up for Visordown's weekly newsletter, Bugsplat, to get the best motorcycle news, road tests and features plus exclusive competitions and offers direct to your inbox. Register as a Visordown member here and tick the box for Bugsplat in your newsletter settings here.